There’s a video editor to suit everyone at FileHippo. Following on from our recent article about Great Video Editing Software For Mac To Download Today, we thought it best to craft a companion piece for all you users of Microsoft’s own operating system behemoth out there. There are probably one or two of you using Windows right now, so this one’s for you. While Apple’s products have long held the reputation of being the operating system of choice for those involved in creative industries or hobbies, Microsoft has been playing catch up in recent years. Much of the advertising around the Microsoft Surface product has been focussed on its power to facilitate creativity and, while this author has unfortunately not been privy to the relevant board meetings, one can only assume this choice of artistic direction is a direct challenge to Apple’s dominance in this field. So, if Microsoft is looking for Windows to be taken seriously as a platform for creative endeavours, it would seem to be a good idea to look at some of the best video editing software available on the platform right now. Here are four of our favourite video editors for Windows in no particular order. Magix Vegas Pro – for the professionals. The artist formally known as Sony Vegas Pro, Magix Vegas Pro has everything you’d expect from a professional video editing suite. You can import HD media from multiple devices and add over 300 filters and other special effects with a few clicks. Specialist tools allow you to add subtitles and other text information easily, and let you optimise image quality. The software comes with a huge selection of sound effects to add to your films, and multiple mixing and balance tools give you total control over the audio. 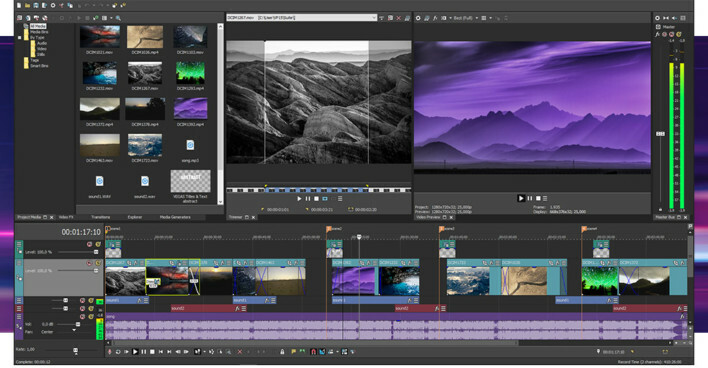 While Magix Vegas Pro has been designed with professionals in mind, it comes complete with a comprehensive suite of interactive help guides, all provided by an active and engaged community. Magix Vegas Pro is available as a one-off purchase, or you can choose between a 3 and 12 month subscription with Vegas Pro 365. Also in the Vegas family are Vegas Pro Edit and Vegas Pro 15 suite, so you can choose the right software for you. Pinnacle Studio allows you to get your project off the ground in style with a range of themed templates on which to build your video. 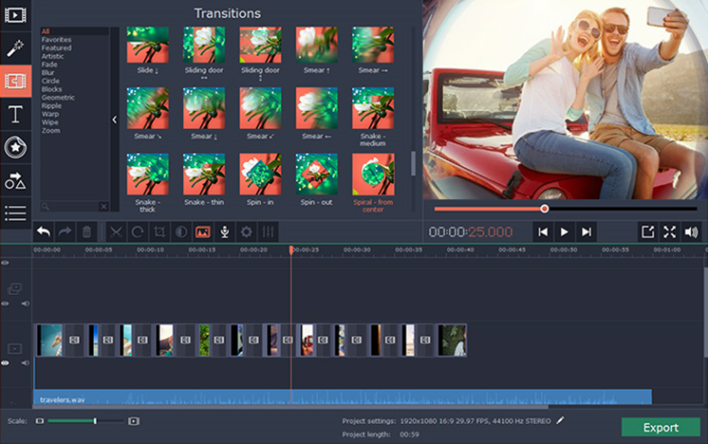 From there you can edit footage easily on the multi-track timeline, and add over 1,500 filters, effects, and titles. Multi-camera editing and split screen functionality give you even more options to play with. You can highlight single colours and fade everything else to black and white, to give your movie that Schindler’s List feeling (although perhaps with less genocide), which is sure to make your film even more eye-catching. With Pinnacle Studio you can also control your camera settings, see overlay frames, set distances, and capture frames automatically. Automatic audio syncing makes sound editing a matter of simplicity as well. 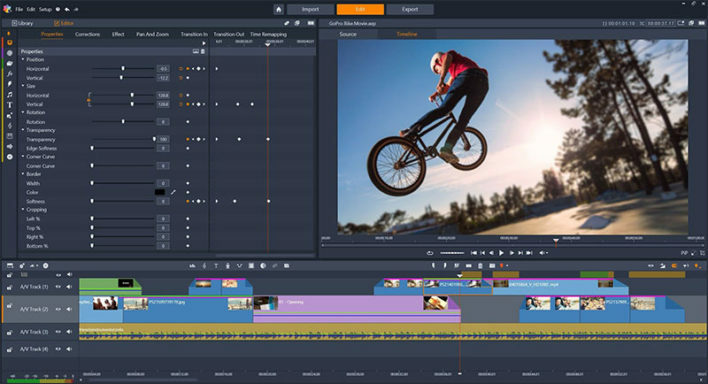 Designed from the ground up to be an easy to use but professional quality video editor, Movavi Video Editor comes with a host of powerful features. You can use footage captured from almost any source, including webcam footage, and edit it into professional looking clips. The automatic Magic Enhance feature allows even amateurs to improve the quality of their video with a few clicks, while more confident users can tinker with brightness, contrast, sharpness and other visual settings to their heart’s content. Movavi also comes with a ton of Hollywood style special effects, including a Matrix style slow down option. To finish off, the software comes with built-in social sharing tools, allowing you to easily upload your finished masterpiece to YouTube, Facebook, and Vimeo. From the ubiquitous Coral Corporation comes Coral VideoStudio Pro. Available in 32 or 64-bit versions, this great piece of software has a very simple interface designed to be friendly to all users, regardless of video editing skill or experience. Aside from all the video editing options you’d want from a commercial level package, Coral VideoStudio Pro gives you far faster render times for 4k and HD multi-track videos than you would normally expect. The innovative FastFlick feature lets you create professional looking demonstrations and tutorials, using a host of templates and screen capturing features. Ideal for those business people looking to make how-to videos and seminars for their marketing campaigns or product launches. 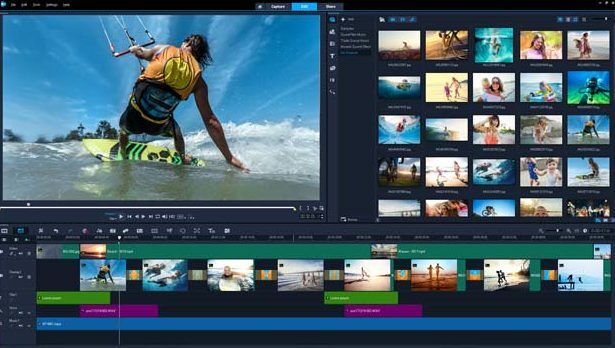 There you have four of our favourite pieces of video editing software which are all available to download from FileHippo right now for free. Try them out for yourselves and see which one takes your fancy, and then decide if you want to upgrade to the full package. Whether you’re an amateur or professional video maker, we’re confident you’ll find one of these to your tastes. In the meantime, keep tuned to FileHippo for loads more great vetted and free software, as well as all the latest news and views from the world of IT and technology.